I’m not much of a shopper. But I’m a really good browser. Heck, I can browse for hours. And if I’m not browsing in a bookstore, the chances are pretty good that I’ll be in one of Traverse City’s many antique shops. Hey, some people love to follow the latest fashions and find the newest items in the marketplace. I’m one of those guys who think that most things get better with age. (It’s certainly been true with me!) Fortunately, TC and its environs are the perfect place to browse for cool old stuff. The Wilson formula has been so successful that they’ve opened another antique mall in another former furniture store, in the village of Acme. It has over 15,000 square feet of space packed with antiques, some of them only as old as the 1950s and 1960s. Baby Boomers, you may be able to find all those kitschy wall ornaments and tables here. 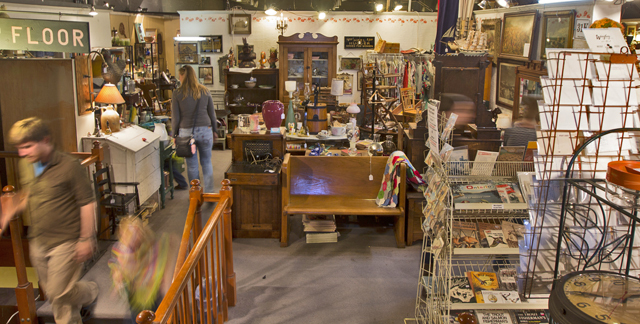 Anyone who thinks antique shopping is strictly a “girly” thing should stop in at Grey Wolf Creek in our warehouse district. 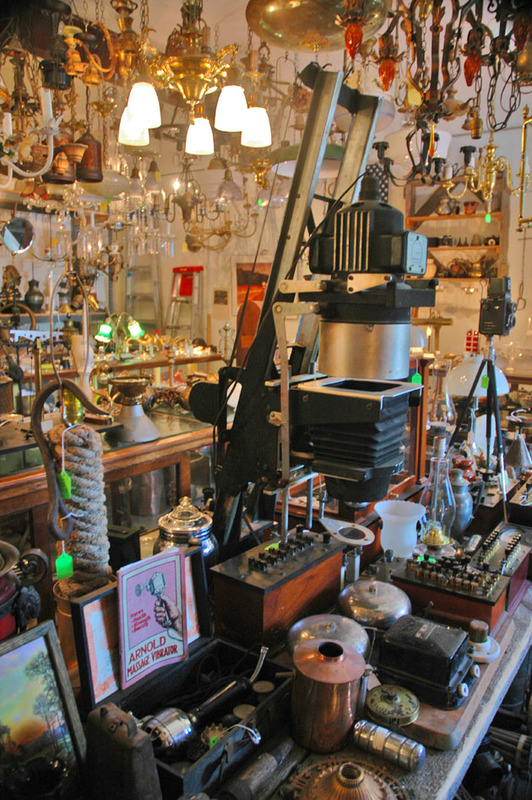 Tucked into the rear of a sprawling building together with a half-dozen other shops, it’s ostensibly devoted to antique lamps and lighting fixtures. But it’s really a cornucopia of vintage early 20th-century technology, with all manner of gadgets and gizmos on display for sale. The new kid on the block -- and it’s a BIG kid -- is the Cherryland Antique Mall & Consignment Center, with 55,000 square feet of booths (88 of them), 72 display cases and a 2,000-square-foot consignment area. It was opened in 2010 by local businessmen Adair Correll and Doug Burkhead in an abandoned shopping plaza on South Garfield Avenue, next to Cherry Capital Cadillac. Furniture aficionados find that it’s worth venturing to obscure Fern Street (south of the railroad tracks between Garfield and Barlow) to Rickman’s Antique Furniture, a workshop with a showroom full of American furniture from all periods and styles. They also do stripping, refinishing and repair for rare and delicate pieces. Another furniture store that’s branched off into the antique business is Furniture Masters on LaFranier Road. Mike Anderson was a service manager for Ethan Allen before starting this place with his wife Barb. In addition to making, selling and repairing furniture, they have an ever-changing “Front Porch” showroom filled with antique furnishings, architectural features, artwork and other items. As one might expect, some of the best antique-hunting surprises are found out in the countryside. 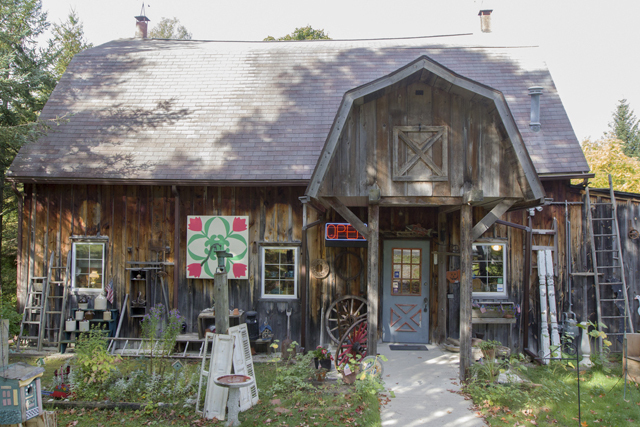 A case in point: Rolling Hills Antiques & Art on Barney Road, just west of town, where Glen and Diane Lundin have turned an enormous 1870 dairy barn into their home, retail store and workshop. 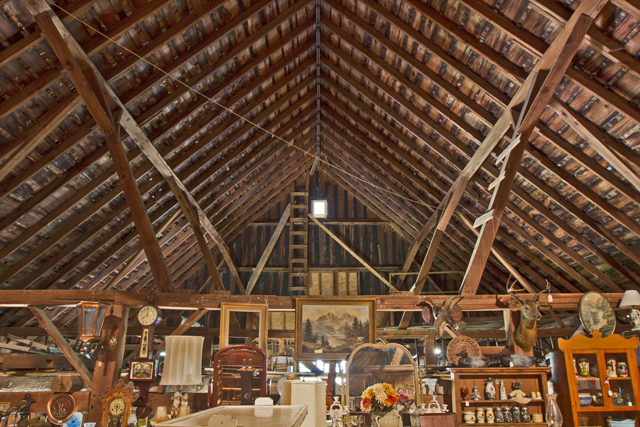 Although they specialize in high-quality American antique furniture – from the late 18th century all the way to the mid 20th century – the loft of the barn contains a treasure trove of cool stuff. On the Old Mission Peninsula (my neck of the woods) Walt & Susan’s Old Barn is exactly what it says – a quaint 1910 barn on Nelson Road whose three floors feature primitive furniture, clothing, toys and dolls, fine china and glassware. (Especially noteworthy is the workshop where Walt keeps his collection of gas pumps, license plates and other “automobilia”. Just down the hill on Peninsula Drive is the 132-acre Edmondson cherry farm, whose former icehouse now houses Cherry Acre Antiques, specializing in vintage postcards, old advertising signs, tins, milk bottles, toys and other antiques. And I should mention our neighbors in Elk Rapids, which boasts three antique shops. Just south of town on US 31 is Lilacs Antiques. (It’s not hard to find; look for the purple building with the antique buggy perched on the roof). Downtown, on River Street, is the Harbor Antiques Mall on River Street hosts more than 35 dealers offering everything from furniture and collectibles to old books and magazines, and A Summer Place, which specializes in period furnishings for the family cottage – furniture, glassware, lamps, etc. And over in Empire, the awesomely named Miser&apos;s Hoard, is part art gallery, part gift shop and part antique store. Lots of fun for browsing when you&apos;ve had too much beach!